eFfing #FossilFriday: toolmakers without tools? Matt Skinner and colleagues report in today’s Science an analysis of trabecular bone structure in the hand bones of humans, fossil hominins and living apes. Trabecular bone, the sponge-like network of bony lattices on the insides of many of your bones, adapts during life to better withstand the directions and amounts of force it experiences. This is a pretty great property of the skeleton: bone is organized in a way that helps withstand usual forces, and the spongy organization of trabeculae also keeps bones fairly lightweight. Win-win. An X-ray of my foot. The individual foot bones are filled with narrow spicules (=trabeculae) of bone. Very often they have a directed, or non-random, orientation: in the calcaneus, for instance, they are oriented mostly from the heel to the ankle joint. This adaptive nature of trabecular bone also means that we can learn a lot about how animals lived in the past when all they’ve left behind are scattered fossils. In the present case, Skinner and colleagues tested whether tool use leaves a ‘trabecular signature’ in hand bones, looking then for whether fossil hominins fit this signature. Their study design is beautifully simple but profoundly insightful: First, they compared humans and apes to see if the internal structure of their hand bones can be distinguished. Second, they tested whether these differences accord with theoretical predictions based on how these animals use their hands (humans manipulate objects, apes use hands for walking and climbing). Third, they determined whether fossil hand bones look more like either group. Comparison of first metacarpals (the thumb bone in your palm) between a chimpanzee (left), three australopithecines, and a human (right). In each, the palm side is to the left and the wrist end of the bone (proximal) is down. Image by Tracy Kivell, and found here. Looking at the image above, it’s difficult to spot trabecular differences between the specimens with the naked eye. But computer software can easily measure the density and distribution of trabecular bone from CT scans. With these tools, researchers found key differences between humans and apes consistent with the different ways they use their hands. Neandertals (humans in the past 100 thousand years or so) showed the human pattern, not unexpected since their bones look like ours and they used their hands to make tools and manipulate objects like we do. What’s more interesting, though, is that the australopithecines, dating to between 1.8-3.0 million years ago, also show the human pattern. 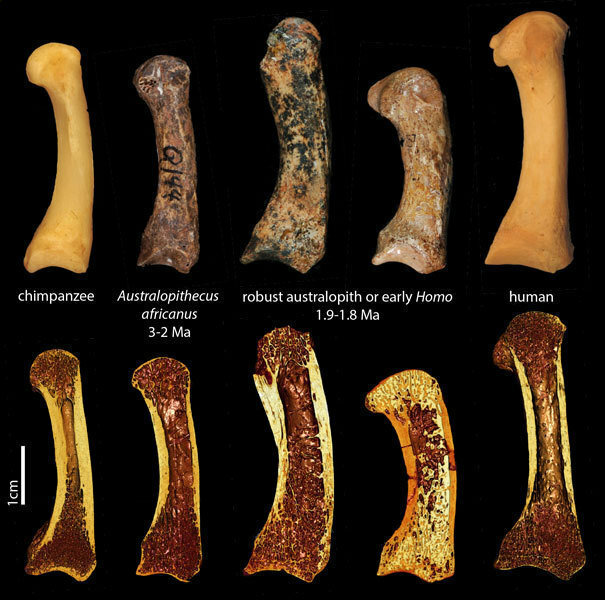 This is an important finding since the external anatomy of Australopithecus hand bones shows a mixture of human- and ape-like features, with unclear implications for how they used their hands. Their trabecular architecture, reflecting the forces their hands experienced in life, is consistent with tool use. This is a very significant finding. Australopithecus africanus fossils from Sterkfontein aren’t associated with any stone tools; bone tools are known from Swartkrans, though it is unclear whether Australopithecus robustus or Early Homo from the site made/used these. In addition, in 2010 McPherron and colleagues reported on a possibly cut-marked animal bone from the 3.4 million year old site of Dikika in Ethiopia, where Australopithecus afarensis fossils but no tools are found. Skinner and colleagues’ results show that at the very least, South African Australopithecus species were using their hands like tool-makers and -users do. This raises many fascinating questions – were australopithecines using stone tools, but we haven’t found them? Were they using tools made of other materials? What do the insides of Australopithecus afarensis metacarpals look like? What I like about this study is that it presents both compelling results, and raises further (testable) questions about both the nature of the earliest tools and our ability to detect their use from fossils.